This multivolume work on the analysis of algorithms has long been recognized as the definitive description of classical computer science. The three complete volumes published to date already comprise a unique and invaluable resource in programming theory and practice. Countless readers have spoken about the profound personal influence of Knuth�s writings. Scientists have marveled at the beauty and elegance of his analysis, while practicing programmers have successfully applied his �cookbook� solutions to their day-to-day problems. All have admired Knuth for the breadth, clarity, accuracy, and good humor found in his books. 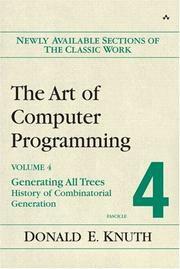 This is by far the longest chapter in The Art of Computer Programming, a chapter on combinatorial algorithms that will itself fill four full-sized volumes. Combinatorial algorithms, informally, are techniques for the high-speed manipulation of extremely large quantities of objects, such as permutations or the elements of graphs. Combinatorial patterns or arrangements solve vast numbers of practical problems, and modern approaches to dealing with them often lead to methods that are more than a thousand times faster than the straightforward procedures of yesteryear. This fascicle primes the pump for everything that follows in the chapter, discussing first the essential ideas of combinatorics and then introducing fundamental ideas for dealing efficiently with 0s and 1s inside a machine, including Boolean basics and Boolean function evaluation. As always, the author�s exposition is enhanced by hundreds of new exercises, arranged carefully for self-instruction, together with detailed answers. Donald Ervin Knuth is known throughout the world for his pioneering work on algorithms and programming techniques, for his invention of th TeX and Metafont systems for computer typesetting, and for his prolific and influential writing. Professor Emeritus of the Art of Computer Programming at Stanford University, he currently devotes his time to the completion of these fascicles and the seven volumes to which they belong. Professor Knuth is the recipient of numerous awards and honors, including the ACM Turing Award, the Medal of Science, the AMS Steele Prize for expository writing, and the prestigious Kyoto Prize for advanced technology.